WOW! 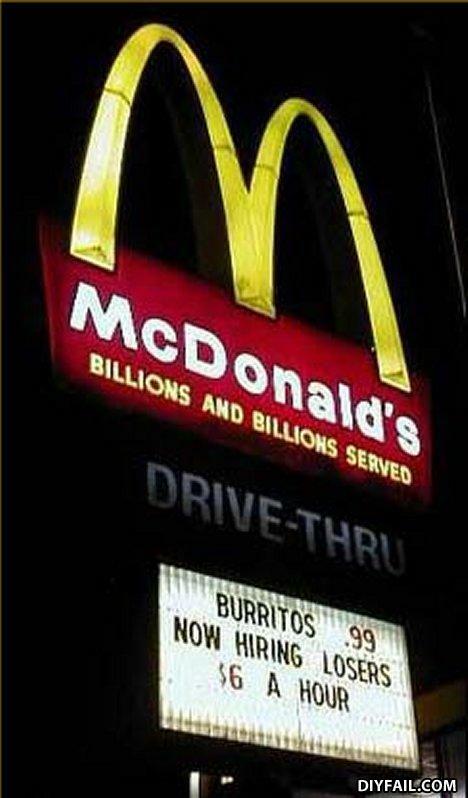 If I work for an hour I can buy 6 burritos! "A" HOUR - BAD GRAMMAR! "THEY PHOTOSHOPPED THE C OUT...." Good point. It appears as though this sign would have at once said "Now hiring Closers". maybe the C fell off? "Truth in advertising." That was proven impossible many years ago. Isn't minimum wage $7.35??? Does no one care? high school graduates need not apply, GED is preffered. TRUTH: Let it be told. And you just got served. What did one guy say to the other guy? ?